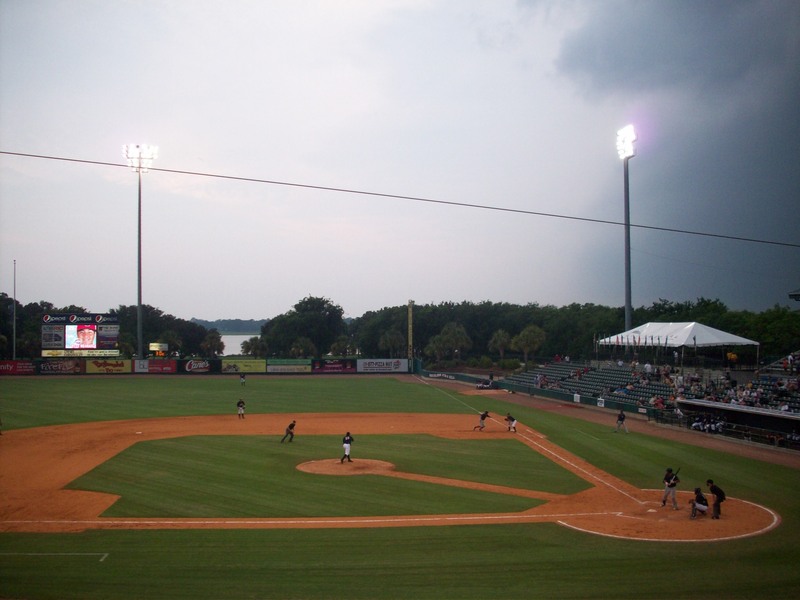 Ballpark Breakdown: Tucked along the Ashley River in the northwest corner of Charleston, Joseph P. Riley, Jr. Park or “The Joe” is a great place to catch a game. Named after the long-time mayor of Charleston. While Mr. Riley did not want the park to be named after him the city council voted unanimously to name it in his honor due to all the work he has done promoting baseball in The Holy City. 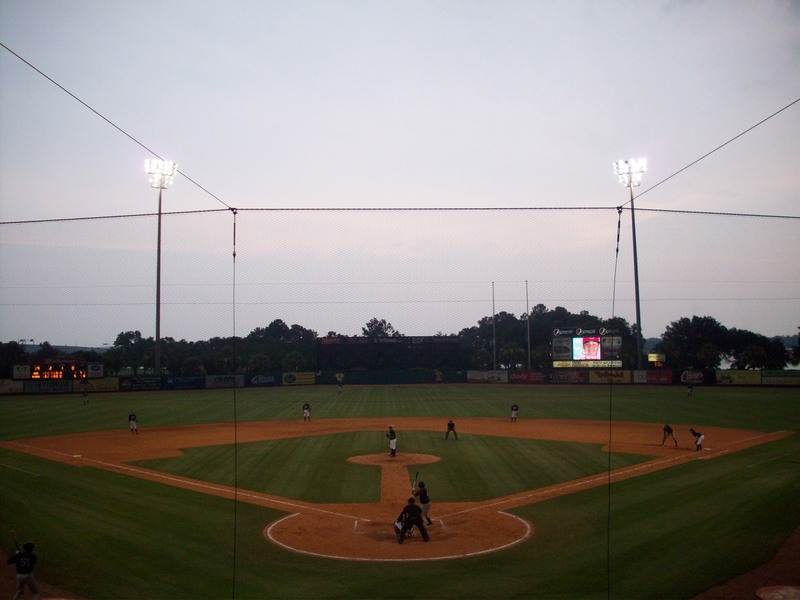 The park opened in 1997 and the RiverDogs share it with the Citadel baseball team. In fact the Citadel has lifetime playing rights at The Joe and they even have their own clubhouse. This arrangement came about due to the fact that the land where the stadium was built used to belong to the Citadel. As you enter the main entrance you climb a set of stairs that lead up to the main concourse in the left field corner. The concourse sits behind the grandstand so you can’t watch the game as you head off to get your food or drinks. However, down the third base side the concourse opens up to the sky giving you a nice open feel. 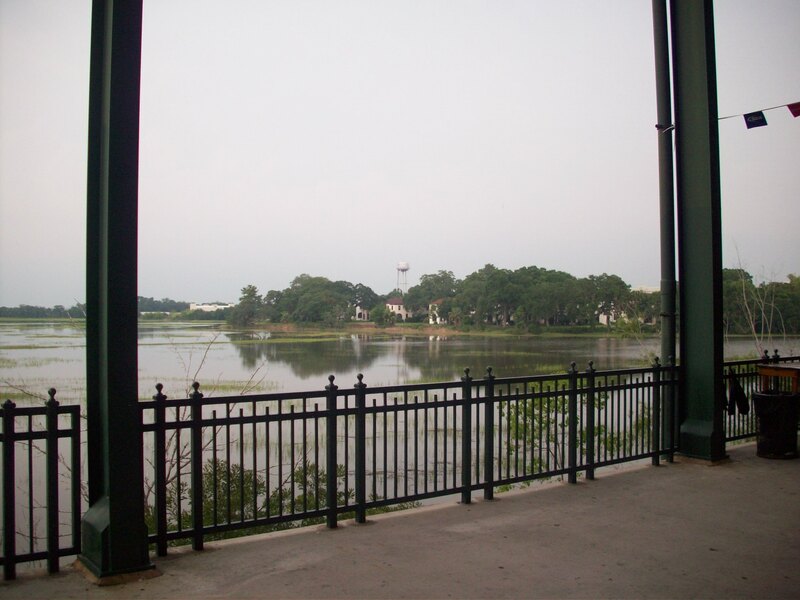 As the concourse wraps around the first base side you can get a close up look of the Ashley River as the concourse goes right up next to the scenic waterway. This is also the only area of the concourse that is covered up by the grandstand above. This proved to be helpful on the night that we were there as a typical southern summer thunderstorm rolled through in about the 7th inning. A large grandstand surrounds the field. The lower section and the upper section behind home plate consist of green seats with seatbacks. 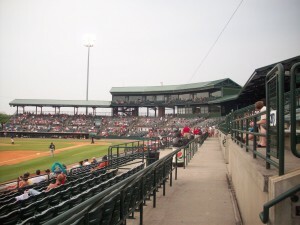 The general admission seating located in the upper sections down the baseline consists of bleacher seating. A decent sized walkway separated the lower bowl from the upper section of seating. Above the seating bowl is the glass enclosed air-conditioned luxury suites, which was a great place to watch the game from while escaping the brutal summer heat. 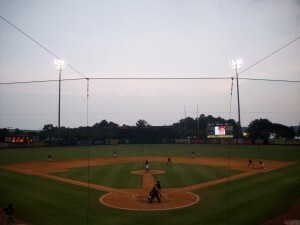 The ballpark offers a number of different options for viewing the game. With the setting on the river the best section to sit to view the river along with the ballgame is down the third base side. There is a swag shop on the third base side of the concourse but on top of that you can find a small booth behind home plate as well as employees with a small cart full of foam fingers and other souvenirs walking around the ballpark. If you are looking to bring a group to the game there are a number of different options for you. In the left field corner there is the Margaritaville. This section has the most options for your drinking preferences from beer to liquor. 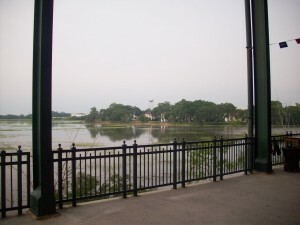 Above the seating bowl is Doby’s Deck which is another large area with picnic tables that can be rented out. Down the first base side is Murray’s Mezzanine. This section has a tent covering the large patio. This is probably one of the best places to see the game from since you have the field on one side and the picturesque river on the other. Mike Veeck (son of the infamous Bill Veeck) is the president of the ballclub but you would never know it from any of the crazy antics his father used to pull. On the night we were there we only saw the typical between inning entertainment (sumo wrestling, t-shirt cannons, etc.). A little of his father’s personality must have rubbed off on the owner however, the most popular stunt he pulled was “Nobody Night” where no fans were allowed in the park until after the game became official setting the record for the lowest attendance at a single game: zero. The Joe also does a great job of incorporating South Carolina’s history into the park. Down in the right field corner is Shoeless Joe’s Hill which is a very small section of berm seating (and the only grass seating in the whole park). As we mentioned above, Doby’s Deck is named after another great South Carolina native, Larry Doby. Not sure who Murray’s Mezzanine is named after. The most interesting aspect of the ballpark maybe the food. Highlighted on the Food Network, Travel Channel and numerous magazines there are plenty of options for the adventurous foodie. There is alligator or duck sausage, a pickle dog (with a pickle instead of a bun) and a foot-long hot dog wrapped in bacon. As far as beer is concerned, they offer typical big brand offerings as well as Palmetto, Sweetwater, Fat Tire and Yuengling. Your best option for the most selections is the bar located next to the Margaritaville area right when you walk into the park. They also bring in additional taps on certain Tuesdays for Craft Beer Tap Tuesday (unfortunately we were there on a Sunday). Taking in a game at The Joe is just what you think it would be. Charleston is a sleepy little southern town with a ton of charm. The RiverDogs extend this feeling into the ballpark with a relaxed and enjoyable atmosphere. The southern hospitality also extends to the friendly and helpful staff and there is not a ton of over-the-top sound effects or theatrics between innings and it has a great view of the water. The Joe really is a great place to catch a game. Brew Basics: An inventive upstart with big flavor and plans. Their tasting room is open Thurs- Sat and has a decent following despite the fact that South Carolina law only permits them to sell four oz sized tasters and not full pints. You are also limited to four tasters per person. 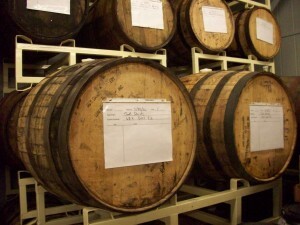 However, there is one way for the layman to get full pints in the tasting room – rent it out. They’ve had many private events there in the year and a half since they opened, including – but not limited to – one baby shower. 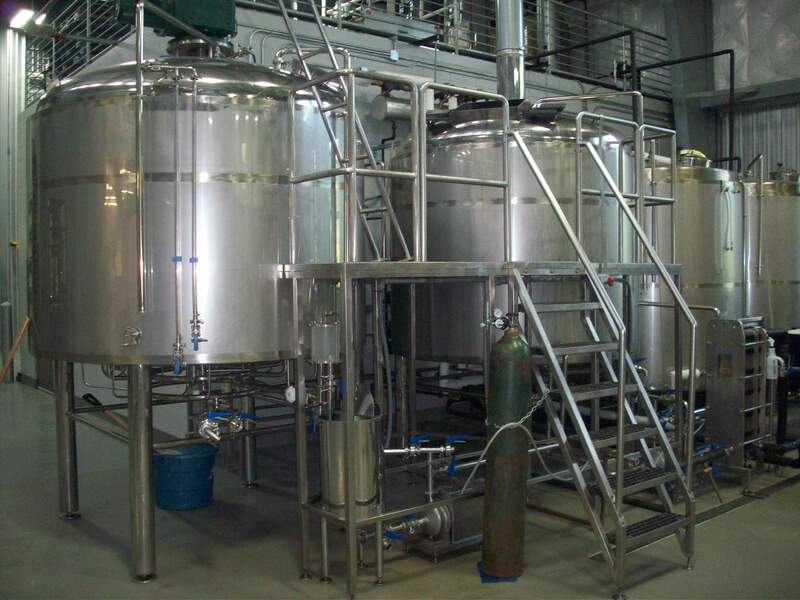 As mentioned, this is a good sized complex with lots of room that includes a barrel room, canning and bottling lines, 6 fermenters, a brite tank, the wort barrels, lots of necessary storage (including a special separate area for the unique flavor hops that aren’t stored in the big grain barrel) office and tasting area. 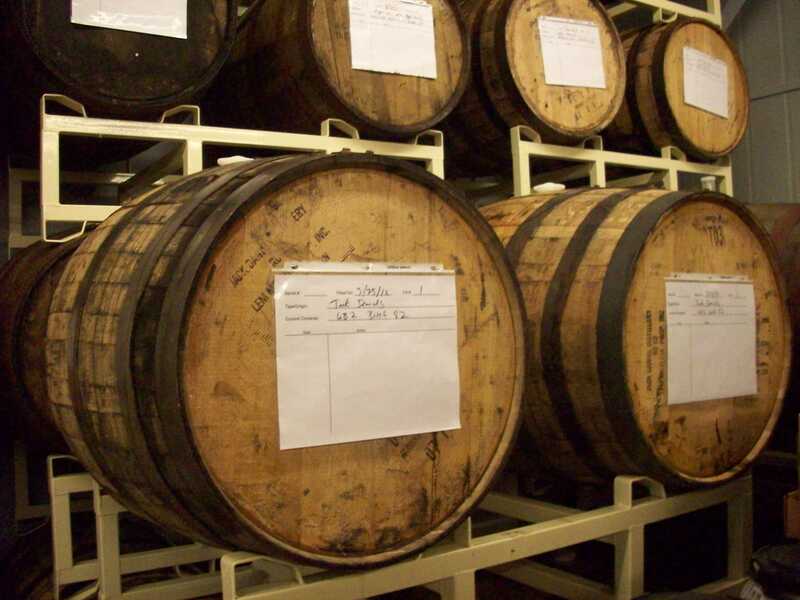 In their first year they were able to produce 1000 barrels, and now in year two with the help of some expansion – including the addition of a second brite tank – they are on track to brew 7,000 barrels this year. This rapid growth seems to still not meet the demand for beer (sorry Virginia, you’re not going to see Westbrook anytime soon…) but it’ll help. 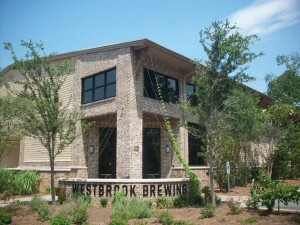 And, it will make Westbrook one of the largest breweries in the state of South Carolina. All of this in just year two. While Charleston is a beer city coming into its own, with several new brewery options, being in The South on a Sunday-Monday meant we were really out of luck when it came to open tasting rooms and brewery tours. An auspicious stop at the Charleston Beer Exchange made our visit when Scott Koon, Westbrook’s assistant brewer, who hails from Pennsylvania and has previous brewing experience at Appalachian Brewing Company (aka ABC Brewing) just happened to stroll in. Friendly from the start to two random tourists, Scott was then kind enough to take some time away from the demands of brewing to show us around Westbrook the following day. For those of you who want to stop by the source but don’t want to be as high maintenance as we were – come by during their regular hours. And if you aren’t around during that time (and can’t stalk the city to find Scott to let you in) they do always have White Tiger and the IPA in cans available throughout the city. Keep an eye out for these, and hopefully* two more permanently available canned styles coming soon. White Thai (5% ABV, 16 IBU) – According to Jim, this one has “a hell of a smell!” It’s a pretty accurate statement, but for those of you who like a little more info the White Thai is a twist on a Belgian Wit Beer. It is the color of a bananay hefewizen with long lasting, very white head, and it’s got a chewy palate that is thick like a wheat or other unfiltered beer. But like we mentioned, it’s the aroma that’ll getcha. The spices in the aroma – especially the ginger and lemongrass – really come through, and it makes you think of Thai food, so the name is apt. Vanilla Tree Dubbel (7.5% ABV, 20 IBU)–It’s the weight of a strong porter both in viscosity and mouthfeel, but it is the color of a brown ale with a decent light tan head. The vanilla is as advertised – pronounced in both aroma and taste which is also sweet brown malty.. Single Hop Amarillo (5.5% ABV, 30 IBU)–. It pours out a serious yellow color and is only moderately carbonated with a full hopped body. Overall, this palate is sweet but not sugary with hints of fruit in aroma and taste, and it finishes strong, with full tart hops. Gose (4% ABV, 5 IBU) – The Gose is a salted German beer, and the recipe is a reincarnation of a beer style that had become extinct. With an extraordinarily low IBU, and a frosted very pastel yellowy hue this this is a lemony, sour beer with good body. Although not Gillian’s favorite style, one can appreciate it for what it is, and also for the willingness to reinvent, and restore the past. Covert Hops (5.7% ABV, 45 IBU) – Black with a big tan head, and an bouquet that is mostly coffee and liquorice notes that blend to almost smell like pumpkin bread. It is a very sour beer that is actually kind of light for being so dark in color. We thoroughly enjoyed it, and weren’t the only ones – it was named one of the top 20 beers of 2012 by Esquire Magazine. They have a whole barrel series on the way, including two wine barrel trippels that sound interesting. One we didn’t get to try (it was still a work in progress at the time) is their Smoking Gun Smoked Stout– Aged a minimum of nine months, it is referred to as an “Uber Beer” coming in at 16% ABV, just one percentage point lower than the legal limit of 17. We’ll be keeping an eye out for this one in our neck of the woods, but if you’ve been lucky enough to try it, email us and tell us about it we’ll add you as a guest reviewer!